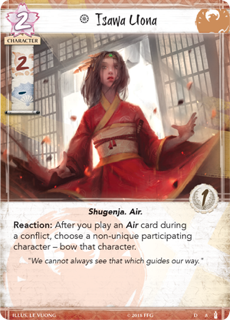 [L5R LCG] Imperial cycle has releases faster than One Punch Man fight scenes. Which, I should note, was the very first post, answering: "Unicorn. Why?" We knew it was coming. Yay! Top 4'd the San Francisco kotei this weekend! Played Crab/ Scorpion splash. Lost in semifinals to eventual winner who was on Crab/Unicorn. I played in my first tourney (as opposed to organizing it). I went 0-3, which is what I was expecting given my limited higher level play. First match was against Crane, second was against Scorpion, third was against Unicorn/scorpion. All three were dishonor losses for me, being too aggressive with my honor. ...And that's not what I was expecting to be announced today. Scorpion Clan Pack: Underhand of the Emperor. Slated for a October release. Whispers of Shadow and Steel, the Scorpion book. Scorpion Clan Pack: Underhand of the Emperor. This seems like a bizarre decision. Either this pushes Scorpion to dominate again or none of these cards get played as they are worse than what they already have. On a positive note, I like that the book is going to be Yojiro-focused. I always respected that fellow (only one of the very few Scorpion characters I could say that about), especially with his whole "eff it, if no one's going to believe what I say, I'm just going to always tell the truth" creed. Wow. Super situational one-shot protection to give you JUST that last little squeeze of effort. Oh god, could you imagine the reaction someone would give if they were going to play Duty to save themselves, but it got cancelled? You know the exact timing of interrupts is gonna be vital for that. Can you cancel a cancel? And apparently Brad is at the UK Games Expo, and previewed a bunch of Unicorn cards. I made the cut at the Grand Kotei with Crab. Didn't play the cut as I'd also made the cut in Netrunner. Nice! Can you post your deck list and strategy? Article just went up with previews of the first pack of Elements. Also has a preview of the new Lion stronghold that's in it. So the new rumored Unicorn stronghold is a actually a Lion stronghold. Oh well, back to the binder Unicorn, you were almost playable. Spoilers aren't allowed in the main sources of my info, but I think someone mentioned that the Unicorn one is going to be similar, just with a caveat that if you have more units than your opponent or something - as opposed to +5 mil strength. That would be weird if they released two new strongholds with such similar mechanics. Also that Crane attachment is bonkers good. It can't copy the Let Go that kills it, so probably not. Then they're not using let go on other good attachments, like Cloud the Mind? Or anything splashed for, like Reprieve? Also that's a more valid complaint pre-RL, but now splashing Dragon will be a lot less common. Right now my focus is on the news about Netrunner, but what's going on does shed some light on why the new LCG Designer Journal series was started. I haven't read it yet, but this article does have some things about L5R in it. Oh hey, there's the announcement for the final version of the core RPG book. As well as the dice pack and GM's kit. Q3... so that's totally a GenCon launch, right? Undoubtedly so. I was expecting that ever since the beta. Pack 2 preview article up. Oh look, a bunch of Shadowlands and maho showing up at the same time as Kuni Yori? COLOR ME SHOCKED. Excited to see Yori! I think he'll be good for a while. The maho/Shadowlands stuff actually seems more interesting to me as a splash outside of Crab. A more aggressive, province-breaking Scorpion deck would probably like them. Stream just started too talking about the Elemental Cycle. Combine that with Force of the River - oh hey I now have up to 12/12 of stats in the conflict, plus maybe whatever was already in there. Couple of Lion previews today from the Imperial Advisor. Pack 3 article is up: The Fires Within. Also the goddamn ninjas are at it again, and there's two Scorpion previews in the previous Breath of the Kami article: Disguised Protector and Deceptive Offer. And man, those Scorpion cards are nasty if you fall into the Scorpion's traps. Also the new Fire province is probably going in Scorpion decks from now on. "Oh, you're going to break this? Let me just Way of the Scorpion your best dude first."